Essentially, the experiment probes the limits of the universe’s ability to store information. If there is a set number of bits that tell you where something is, it eventually becomes impossible to find more specific information about the location – even in principle. 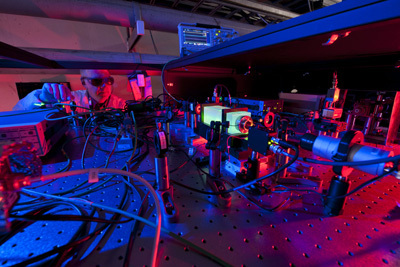 The instrument testing these limits is Fermilab’s Holometer, or holographic interferometer, the most sensitive device ever created to measure the quantum jitter of space itself. Now operating at full power, the Holometer uses a pair of interferometers placed close to one another. Each one sends a one-kilowatt laser beam (the equivalent of 200,000 laser pointers) at a beam splitter and down two perpendicular 40-meter arms. The light is then reflected back to the beam splitter where the two beams recombine, creating fluctuations in brightness if there is motion. Researchers analyze these fluctuations in the returning light to see if the beam splitter is moving in a certain way – being carried along on a jitter of space itself. “Holographic noise” is expected to be present at all frequencies, but the scientists’ challenge is not to be fooled by other sources of vibrations. The Holometer is testing a frequency so high – millions of cycles per second – that motions of normal matter are not likely to cause problems. Rather, the dominant background noise is more often due to radio waves emitted by nearby electronics. The Holometer experiment is designed to identify and eliminate noise from such conventional sources. The Holometer experiment, funded by the U.S. Department of Energy Office of Science and other sources, is expected to gather data over the coming year. This entry was posted in COSMOLOGY, High Energy Physics and tagged Holographic Universe. Bookmark the permalink.